These Impact Attenuators Reduce Rear End Collision Damage and Whiplash. Hit While Parked and the Rear End Collision! Withstands Impacts Over 30 MPH! Dear Jeff: I was taking my now 4 month old son and our dog for a ride this afternoon when I was rear ended by a car going 30 miles per hour. I barely felt the impact and neither my son (he was checked out at the hospital to make sure) or dog seemed to be impacted by the collision. Engineered To Protect The Occupants! The rear end collision is the most frequent vehicle accident and tailgating and texting are the top 2 reasons you’ll end up in one. The results of that stupidity for you are vehicle damage, whiplash, higher insurance rates and a Car Fax report devaluing your vehicle – and no matter what you do, you cannot stop them. 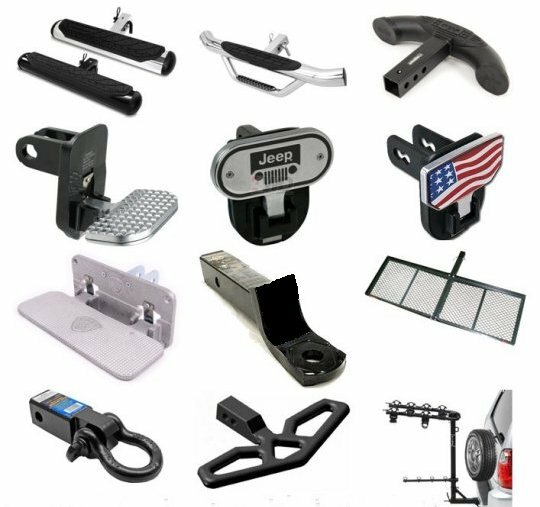 All receiver hitch products (like the ones shown here) were built for a specific purpose like carrying, stepping, hauling, towing, recovery, etc. NONE Were Engineered for Occupant Protection! Receiver hitches alone – without anything in them – increase rigidity. Rigidity influences the “crash pulse” in a rear end collision. Less crush distance and a “stiff” pulse will cause greater acceleration to the head and neck…up to 5 times the speed of the “bullet” vehicle. 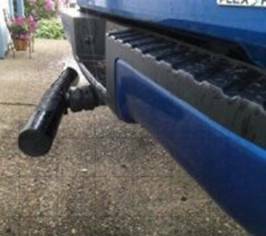 When passenger cars rear end your higher riding pickup truck or SUV they don’t hit your bumper – they hit your receiver hitch. That transfers all the crash energy directly to the frame and the occupants increasing your risk of whiplash by 22% because there’s NO give. Consequently anything else you pin into your receiver hitch that is not energy absorbing (like the products above) will simply move this whiplash problem outward. The danger – women and children are already 3 times more likely to get injured from whiplash then men because their necks are not as strong. Even impacts as little as 3 mph put your wife and kids at risk. For a FREE report on “How Receiver Hitches Hide Damage and Increase The Risk Of Whiplash” click here. Receiver hitches prevent damage…and although you may think that’s a good thing your biggest problem arises when someone in your vehicle gets injured. The first question their insurance company will ask you after looking at your vehicle is “How could you possibly have been injured – theres no damage to the rear of your vehicle?” Now you’ll need an attorney You have a vehicle which shows no damage and an insurance company that wont pay for injuries because they think your lying. You could be waiting 3 years or more for compensation – if you win that is…which is why we have an attorneys only page on this site. Soften The “Crash Pulse”. When our impact attenuators are hit, they absorb crash energy and soften the crash pulse to reduce the risk of whiplash and vehicle damage. An impact attenuator gradually decelerates the “bullet” vehicle to protect the frame of the vehicle and the occupants from injury. But dont take our word for it. 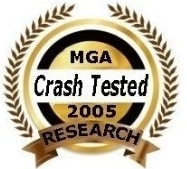 Read the 60+ “crash” testimonials below. NOTE: In a rear end collision, 6 out of 10 will be DIRECT HITS and 3 out of 10 will be at least 2/3 overlap. THATS WHY YOU DONT NEED A MONSTER REAR BUMPER. “Peace Of Mind” Everyday You Drive! So Why Do You Think I Need A Sparebumper? Do You Think I’m Going To Get Hit In The Rear? No. But I Carry A Spare Tire Thinking I’m Never Going To Have A FLAT! Crash certified, shock absorbing impact attenuator…Our most popular model. 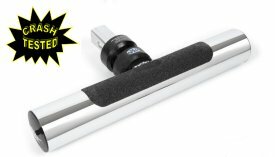 SPAREBUMPER Model SP424 Available in black or stainless steel. Model SP424 is a 4 inch tube style impact attenuator 24″ in length. 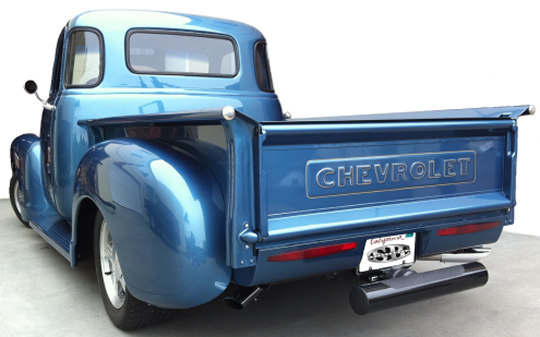 Applications: Any vehicle with a 2″ receiver hitch. The safety of swapping your ball mount when you get done towing for one of these crash attenuators / bumper guards far outweighs the consequences. If you have back up sensors see our chart. This patented crash certified attenuator reduces damage and the risk of whiplash by softening the “crash pulse”. Works on any vehicle with a 2″ receiver hitch. Not Another Cheezy Plastic Hitch Cover or Bumper! Bumper Shield on a Ford Expediton. The Bumper Shield Magnum fit 2″ receiver hitches. The XL25 fits 1 1/4″ receiver hitches. The Magnum hitch cover is 20″ wide by 6″ high 3/8″ thick steel plate. 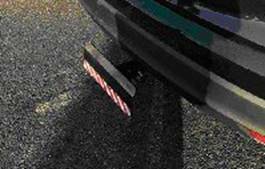 The XL25 hitch covers are 16″ wide by 6″ high 3/8″ thick steel plate. They only stick out 4″ beyond your receiver hitch. Check our back up alarm chart. 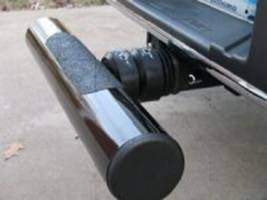 World's Only Receiver Hitch Step that absorbs impact up to 30 MPH! Helps reduce and prevent damage from rear end collisions. 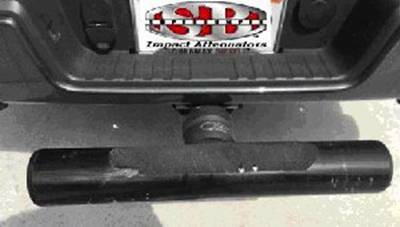 Shock Absorbing Rear Bumper Guard that absorbs impact up to 30 MPH! Reduce or prevent rear end collision damage and helps avoid whiplash! People are talking about their Superbumper… and the reviews are in! 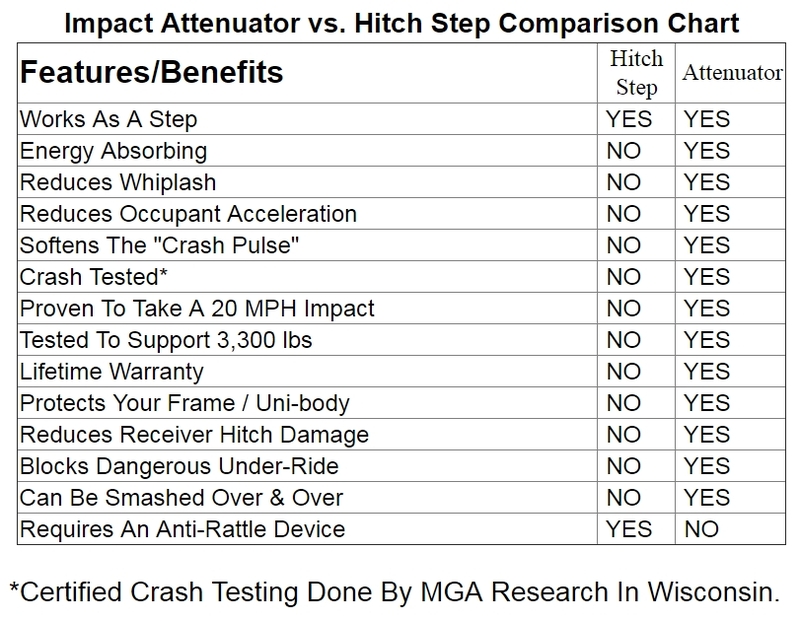 See what customers are saying; the looks they get; and how they feel “protected” by the world’s only receive hitch step that absorbs impact up to 30 mph! Just ask! We would be pleased to answer any questions you got! Will it fit my vehicle? Which one should I buy? We’ve got the answers you’ve been looking for! Just ask! FACT: 80% Of All Rear End Collisions Are Caused By Distracted Drivers. “Hey Jeff, Yesterday I pulled the ‘Sparebumper’ off the Ridgeline – I wanted to hit it with a fresh coat of paint. That bumper has taken so many hits for me – mostly low speed parallel parking rubs, and it bears its scars proudly until I re-spray it from time to time and it turns up like new! About 3 months ago I was rear-ended (it was low speed) by an old lady in a monstrous Cadillac sedan. No damage to me at all – it was nice to not worry about anything. Who knows what my bumper would have looked like without my Sparebumper though…It’s paid for itself so many times. FACT: Women And Children Are 2 Times More Likely To Get Whiplash As A Man…Their Necks Are Not As Strong. Not sure which Superbumber is right for you? Got Questions? Let us know and we’ll get right back to you! 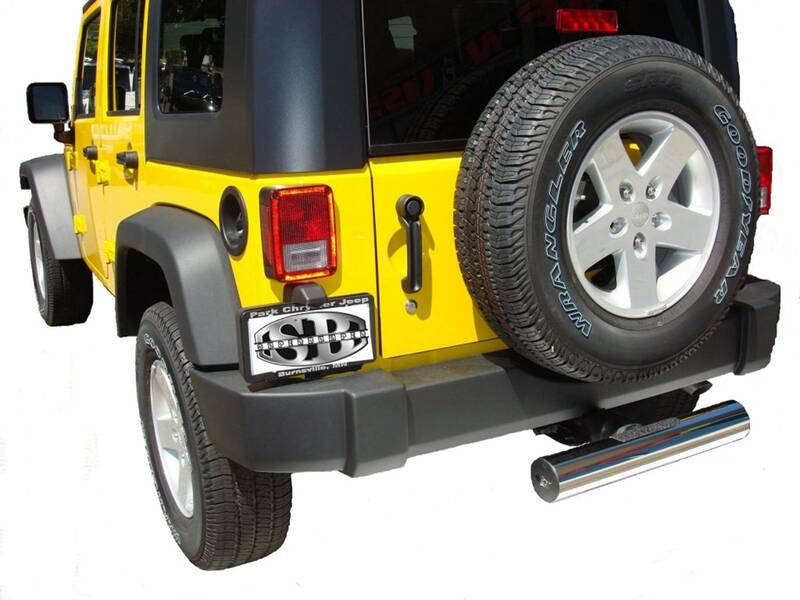 Superbumper is the world’s only Shock Absorbing Receiver Hitch Step! It absorbs impact up to 30 mph – and that means it will reduce damage from rear end collision and whiplash too! In other words, one product protects you and your family from whiplash; your vehicle from damage; and your insurance from rising! Because receiver hitches are so strong they prevent vehicle damage. And although you may think that is a good thing big problems arise if someone in your vehicle gets injured. 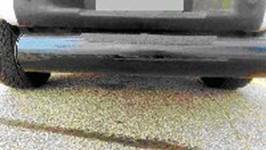 The insurance company will access your vehicle damage and say: “No Damage – No Injury”. Now you’ll need an attorney and you’ll be waiting 3-5 years for compensation – if you win that is. That’s why we have a section on this web site for attorneys. So don’t wait! If you’ve got questions, just complete the form and we’ll get back to you as soon as we can! If you don’t have the time to detail everything, pick up the phone and call us at 844-402-4230! Hi Jeff, Just so you know, we are very satisfied with your product. My mother asked us for one for her Chevy Suburban for Mother’s Day, because she does not like to be tailgated with dogs in the back and, in case somebody rear-ends her, she wanted the extra protection. She also has herniated discs in her neck and has had cervical fusion surgery, so the whiplash reduction was also a selling point. We received our bumper and she’s had it on her truck for less than a month and a half, and somebody hit us from behind at a red light tonight with both dogs in the back. The girl that hit us had to be doing at least 15-20mph since it was a pretty loud impact sound, but we were barely jostled and neither our truck bumper nor frame had any damage. Sadly, the Sparebumper was bent and we will be needing a new one. I was curious if the warranty will cover this? We will be picking up the police report tomorrow. Again, I want to thank you for this product because it saved the truck from damage, as well as protected us and our dogs from whiplash. I will attach some pictures of the bent Sparebumper. 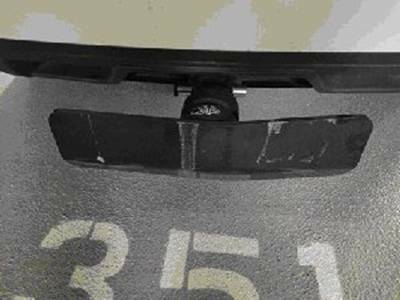 Sherry T.
Jeff: I have had my Sparebumper installed for a couple years on my Toyota Tacoma. Today while sitting in stop and go traffic on 695 outskirts of Baltimore, I was hit in the rear. The striking vehicle was a Yukon Denali, that was going at least 15 mph. The truck took a pretty good jolt, but when I got out to look there was no damage to the Sparebumper or my truck, other than the end caps falling off. The Yukon had a pretty good dent in the front bumper. I continued the drive to work and then the approximately 100 mile ride home at the end of the day and there were no issues with my truck. I cannot express how happy I am with this product. Thanks! Ed M.
Jeff: Your product works great and performed exactly as advertised! I was stopped at a traffic light in a busy area during a frantic lunch break when I heard the screeching of tires behind me. A vehicle slammed into the Jeep that was just behind me and then that Jeep impacted me and pushed me several feet forward. I got out of my car to inspect and saw that my Bumper Shield had been hit hard and was bent, but there was no damage to my car at all! The Jeep had some dents and compression to its bumper, but the car that did the initial impact had its front end completely pushed in. While we were waiting for the police to complete their report, everyone wanted to know where I got the Bumper Shield. They were impressed with how well it worked. Thanks for making a great product that really works! Chris S.
Hi Jeff, I just wanted to write and say thank you. I stupidly backed into a cement pole at our parking structure today that I wasn’t expecting to be there. It saved my Porsche Cayenne’s bumper and tailgate I’m sure. My neck is a little sore, but I hit the thing pretty hard. Bent the crap out of my Magnum (see attached), and I definitely felt the slow give rather than the full on stop and crunch. Couldn’t be more thankful right now that I bought your invention. Alex M.
Hi Jeff, well I finally made use of the Sparebumper I got from you a couple years ago. Yesterday I was sitting at a red light and saw in my rear view mirror a pickup truck coming up on me. I could tell the driver was distracted talking on a cell phone and just knew he would not be able to stop in time. And he didn’t! He rear ended my truck without even hitting his brakes. Fortunately he was not traveling very fast. You can see in the pictures that the bumper took the impact. The truck bumper was scratched a little but no real damage and I was not injured at all. This super bumper is a great device. And I am getting a replacement for it now. Oh just for information, the individual that hit me, did not stay around. The damage to his vehicle was much worse than mine but his vehicle still operated. We agreed to pull over into a parking lot to exchange info and when I pulled into the lot he sped off in a different direction. But God is good and with the use of the Sparebumper there were no human injuries. I am sending the pictures in a separate email. Also I would like to upgrade the new super bumper to the stainless steel model. Thanks, Charles. Hey Jeff: I guess it was inevitable, but my Sparebumper paid for itself when my wife got read-ended. The Sparebumper was completely destroyed on impact, but it saved me thousands in damage to my truck. Brenda suffered no injuries. As my wife told the story of this accident; she was stopped at a red light at an intersection when she felt a “slight bump” from the rear. 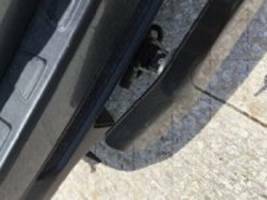 See photos of what a ‘slight bump’ looks like when the Sparebumper does its thing. Les S. BC Canada. Hi Jeff, Last week, I stopped at an intersection for an ambulance on a call. The driver behind me didn’t get stopped, and he nailed the Sparebumper on the back of my truck. He had one of those aftermarket diamond-plate steel bumpers on his truck, one you can’t dent with a sledgehammer. I heard the BANG, but was never jolted or thrown forwarded in my seat. We pulled into a nearby parking lot and had a look at the damage: (see the diamond plate marking?) The Sparebumper compressed about two inches on impact and popped out, as it was designed to do. The anti-rattle spacers were both destroyed. We gave the rear end a good look and could not see any other damage, aside from the hitch receiver possibly being slightly bent. Very apologetic, he gave me his insurance information and we our separate ways. I took the truck to a body shop yesterday to see if they could find anything. The estimator was absolutely AMAZED that the only damage was to the Sparebumper and the hitch (it turned out that the receiver socket was indeed bent slightly to the right due to the off-center impact). No bumper damage, no paint damage, no damage to the backup sensors or anything else. He took pictures and asked me a lot of questions. He’d never seen anything like it before! The total cost for repairs will be $475 for a hitch replacement plus the cost of the new Sparebumper. A few years ago, I was rear-ended at a stoplight in another truck. The damages were $4000 with a conventional bumper … I estimate that if I had not installed a Sparebumper, I would have easily had well over $4000 damage on this truck due to that diamond-plate bumper. $475 versus well over $4000 and being in a rental car for a week? I’ll take $475 any day. Feel free to post this to your Facebook page if you like. THANK YOU for a fantastic product! I WILL NOT be without one! 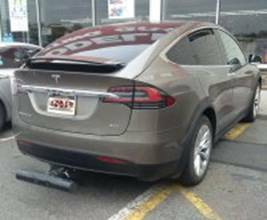 – Glenn F.
Jeff, Last week while I was stopped at a traffic light, a new Audi Q5 ran into the back of my Tesla Model X toting your Super Bumper. Hello Jeff – I bought a bumper shield 2 years ago and gave it to my sister to install it to her husband’s Honda Pilot. Luckily, it was there because they were hit at the back while waiting on a red light. The Shield was a little bit bent and the rubber shock absorbers need replacement. It just happened a few hours ago. My sister is very thankful for the bumper shield I gave her. And they are now shopping for a front hitch to install your product. Best regards and more power to your company. Teofilo S. PS The car who hit them has a major damage. The Honda Pilot has scratches on the rear bumper and has no structural or major damage. 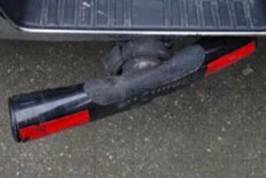 Jeff: When I bought my new 2016 Chevrolet Colorado last year I bought a Super Bumper to protect the rear bumper from damage. Yesterday, in typical rush hour Southern California traffic it was put to the test. I was rear-ended when the traffic stopped abruptly. I looked in the mirror and saw the car that had hit me. Its front grill was smashed and the radiator was spewing steam. After I pulled over to the side of the freeway I assessed the damage to my truck. A little paint was scratched off of the Super Bumper and the non-skid tape was torn in one corner. That was it! No damage at all to my rear bumper. Thanks for making such a great product! The other car was probably going 15-20 mph when it hit my truck. The Super Bumper really stopped the other car quickly. Jeff: I got rear-ended today at a red light in my 2011 Ford F-250. 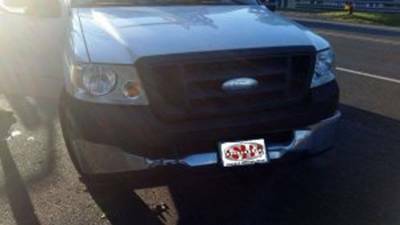 The guy who hit me had an F-150 (picture attached) and it totally creamed his front bumper, he could not drive the truck. The hit must have been at about 25 MPH. I could hardly feel the impact, no injury whatsoever. 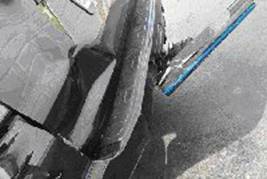 The Sparebumper absorbed all the impact – there was no damage to my truck at all. He didn’t want to report to police or insurance, so I said OK – just buy me a new Sparebumper. So he agreed. 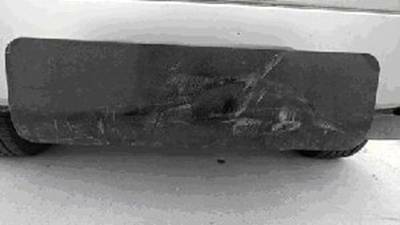 The F150 had extensive damage to the bumper – you can see the imprint of the Sparebumper to the right of the license plate. No damage above bumper, though – so it really saved his grille. Sorry for the sun glare – it was taken into the sun. The F250 was undamaged except for the Sparebumper. I looked underneath, and the hitch assembly looks undamaged also. Thanks for a great product – you should go on Shark Tank and get every truck in the USA to get one! Bill Betz. Jeff: I just want to say thanks to an outstanding product! I got this Sparebumper since I travel with working dogs quite often; I thought it could be additional protection to my truck and dogs. Well, about 0830 the 10th of September, I was traveling around 25MPH approaching a red light, when from behind me a Toyota Camry hit me (Ram 1500) traveling in excess of 45MPH. Other than my coffee being spilled and the damage to the spare bumper, I for one wasn’t hurt at all and not a scratch on the truck! What was interesting, there was very little damage to the other car. Hey Jeff, Yesterday I pulled the ‘Sparebumper’ off the Ridgeline – I wanted to hit it with a fresh coat of paint. That bumper has taken so many hits for me – mostly low speed parallel parking rubs, and it bears its scars proudly until I re-spray it from time to time and it turns up like new! FACT: The National Average To Fix A Bumper Cover is $450. To Replace It $950. “Ok…so check this out. 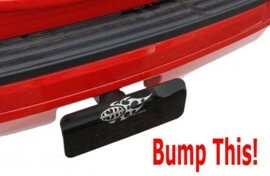 Yesterday I was driving by a local high school, which happened to be getting out, and I was stopped at a light in front of it and I got rear ended by some high school 16 year old…but I was fine because I had one of these things in my trailer hitch – It’s called a Superbumper, well actually I have the Sparebumper which absorbed all the impact from the car that hit. Hi Jeff, After having my E350 washed, I noticed a considerably large (3 inch tall & 4 inch long) blue paint streak on my Superbumper. This probably happened when someone in a blue vehicle was trying to park or exit. I’m certainly glad that I had installed the Superbumper since it most likely saved both my electrical trailer connection as well as some of my back-up sensors in the rear bumper. You have a great product. Hi Jeff, I installed the chrome Superbumper on Sunday and my wife was rear ended on Tuesday. She was hit by a Honda Accord and the Superbumper suffered only a few small scratches to the finish and the black skid pads. The Honda Headlight and left front bumper were smashed! Yesterday two co-workers told me they were going to order some for their trucks. FACT: 48% Of The Drivers That Hit You In The Rear Are Not Even Slowing Down…78.1% Do Absolutely Nothing To Avoid The Crash. Hi Jeff – Yesterday somebody rear ended me while I was stopped. No damage to the (Honda) Ridgeline, but the Superbumper is ruined. I certainly would have had significant damage to the rear bumper otherwise. I’d say she was going at least 10 mph because there were no sounds of last minute braking and she told me that she was “watching the rain in the distance.” In reality, I would not be surprised if she was pushing 20 mph. Jeff: I have the Sparebumper model 318 (Mercury Mountaineer pictured in the customer photos section.) I was hit in the rear about 3 months ago…No damage to my truck or the Sparebumper. FACT: Only Passenger Cars Have 2.5 mph Bumpers – Pickup Trucks, SUVs and Mini Vans Do Not. Jeff, I previously purchased a Bumper Shield for my 2008 Yukon . Last winter, I had to stop abruptly on an icy freeway and the guy behind me was not able to stop. End result: One tiny scratch on my Bumper Shield while his vehicle had to be towed away with damage to both fenders; hood, radiator, and bumper. FACT: 75% Of All Rear End Collisions Are Less Than 10 mph. FACT: 94% Of All Rear End Collisions Occur On Straight Roads. FACT: On Average, Your Insurance Will Rise 40% If You Make A Claim. Last week my wife was in a supermarket parking lot in Pahrump, NV, stationary, waiting for a car ahead to pull out of a parking space, in our ’07 Dodge Ram 3500 with Superbumper. A teenaged female cell phone operator, who was incidentally behind the wheel of a late-model Honda Civic, failed to see the large red truck in front of her and impaled the left headlight assembly on the Superbumper at a very low speed. Consequences? Some of the dust knocked off the Superbumper, No scratches in the chrome. FACT: 80% Of All Bumper Scratches Occur During Parking. Jeff – A SECOND product testimonial. Yesterday my wife was loading groceries into our Dodge Ram 3500 (with Superbumper) in a Costco parking lot in Las Vegas, when an idiot female, using a cell phone, made a direct hit on the Superbumper with her PT Cruiser. FACT: 56% Of All Rear End Collisions Are DIRECT HITS! There are two scratches on my Superbumper, one received just this week when a kid in a Corolla didn’t hit his brakes as fully as he should have. The tap was actually kinda minor, and my truck has zero damage, but his front bumper, license plate, and some of his grille incurred a good whack. FACT: After Your Rear End Collision You’ll Spend: 35 Minutes At The Scene Filling Out Reports; 78 Minutes Filling Out Reports After The Scene; 4 Hours Getting Repair Estimates: The Average Time Without Your Vehicle – 2 Days. Dear Mr. Mohr, I’m writing this testimonial as to the quality of your product. One day, on the way back from the Ridgewood , NJ inspection station, I came to a stop sign on the intersecting main street. When I came to a stop in my Ford Excursion, I felt a BIG BANG on the back of my truck. To my surprise, someone ran up to my window and started screaming at me that I had stopped too suddenly. Fortunately the car behind this person was an on duty Ridgewood policeman. The lady tried to tell the policeman that I came to a complete stop at the stop sign and she was too far from the break pedal – as it was her husband’s car. The policeman advised her that it was her responsibility to adjust the seat before driving off in the car from home. When I went to the rear of my truck to check the damage with the policeman, I only observed a tiny nick on the ball of the SUPERBUMPER. Your product saved my vehicle extensive damage! Unlike the Lexus which had to be towed home. 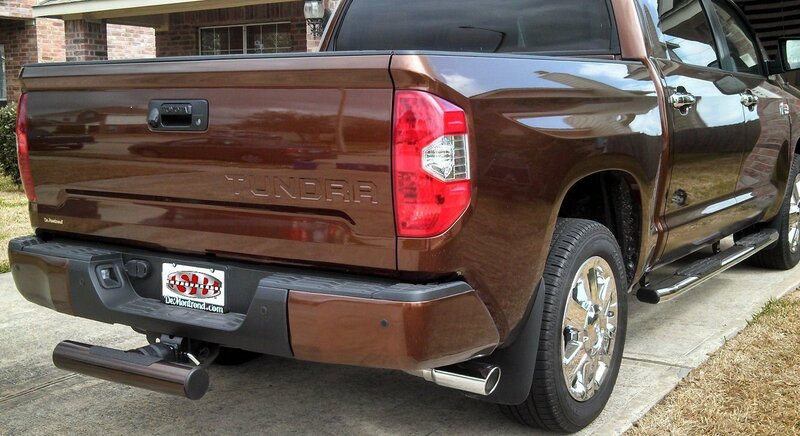 World’s Only Receiver Hitch Step that absorbs impact up to 30 mph! Do you realize that rear end collision is the most frequent type of vehicle accident – and now you have a way to protect you and your family from tailgaters and texting drivers!